Today news just in HOT off the wire ……. Don’t suppose he’s feeling quite so well this morning then !! « Federer should take a leaf …..
Wow! A Kenyan politician doing the honorable thing! Or even: Wow! A politician doing the honorable thing! 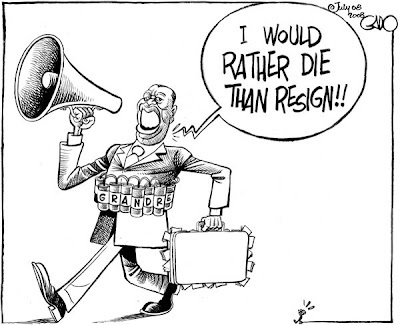 I knew Kenya would rise from the ashes, and common sense would reign once again in parliament – or am I jumping the gun with rose-tinted glasses of gin and tonic? LOL! Loved the irony in your post today. Made me chuckle. DM – Not sure if it really was a case of stepping down rather than being pushed rather hard! Aims – Mmmmm, again not sure if it’s as noble as it seems. I quite agree, but for any politician to relinquish his post is a step in the right direction. In the UK you can always tell when an MP is about to go. The PM states that said MP has the full backing of the party – a political death knell if there ever was one.